My one and only hairdresser moved. Seems ridiculous, right? It’s not if you know me. My mother and I take a salon day while she’s in town. She was attending a medical program at John’s Hopkins in Maryland and had left my sister and I at two different friend’s houses for the better part of a year. While I applauded my mother’s then-ambitious efforts, I don’t think she ever truly researched the woman with whom I was living. So it was quite surprising when, on the way to school one morning, we get pulled over (in my mother’s car, tags expired) and the woman had a warrant out for her arrest. I didn’t really care about that; I had a paper due that day and I proceeded to ask the officer how was I to get to school. He promptly told me to shut up before I got smacked in the face. That summer was also the first time I got dry-humped by a neighborhood kid. I was willing, but it was extremely awkward, what with the audience and all. Anyway, I let a girl cut the front of my hair, since I didn’t have a ‘style’ and, of course, it was messed up. So my mom took me to the salon: me for a wash, trim and style and an entire head of microbraids for herself. Even with three women working on her head, it took forever. So my hairdresser and I had a nice chat before she got started. So you could imagine my angst when the one hairdresser I had discovered in college who actually listened to what I wanted, who styled me to perfection for several years, up and moved to Atlanta. I had already been traveling back to Gainesville from Tampa to get my hair done, but now to another state? Was it that serious that I couldn’t find a stylist in Tampa? Picture the above: much shorter with a square center section on the crown rolled forward and a long piece in the back, extending just beyond my shoulder blades. 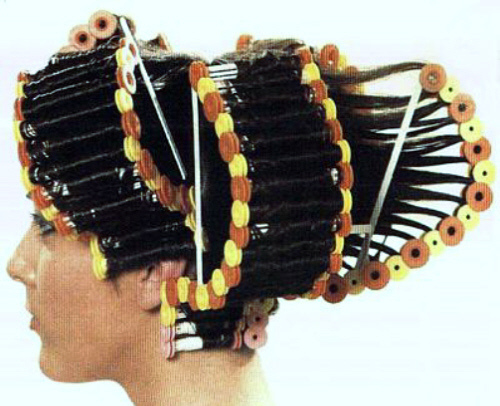 Minus the rollers. Now picture it on a 13-year-old, who is already very different, trying to fit in with a bunch of neighborhood kids. I went to Atlanta to get my hair did. The trip served two purposes: to get my hair properly coiffed and to see what Atlanta had to offer. I had been in constant communication with a good friend of mine, Lamar. Lamar was all fashion, all fierce, all the time. He was also a makeup artist and had been priming me for a big move to the A. The makeup scene is hot, he said. You’ll be working in no time, he said. I have more work than I can handle, he said. At this point, I was still on the fence, but I figured it was as good an excuse as any to take a trip. Off to Hotlanta I went.